Gulgurn Manja (pronounced Gulkurn Manya) meaning hands of young people, is a rock shelter at the northern tip of Gariwerd. From here the small groups of Jardwadjali would have been ideally positioned to see the fires of other groups on the plains to the north. They also used the local finegrained sandstone to make stone tools. Marks where stone has been broken from the walls can still be seen in this shelter. The paintings at Gulgurn Manja include bars, emu tracks and handprints. 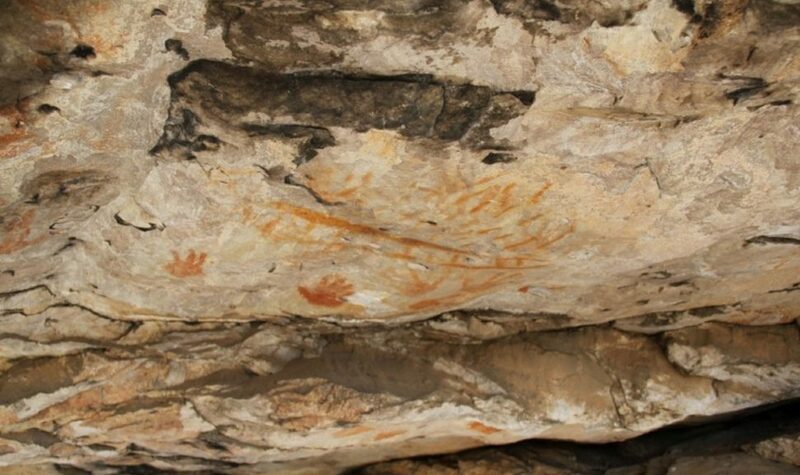 Handprints such as these are only found in northern Gariwerd, and many here were done by children, hence the Aboriginal name for the site. These paintings were part of a unique local art style which was used to tell stories and pass on the law of the people.